We are proud to announce the launch of a fantastic new casino promotion! Join our new partner Energy Casino via this page and get a €/£5 no deposit bonus to play the best NetEnt, Microgaming and Novomatic slots! Plus, make your fist deposit and receive a 100% bonus up to €/£150! Energy Casino were established as recently as 2013 and feature games from trusted providers such as Microgaming, Netent and Novomatic. From Terminator II, to Book of Ra, to Starburst, Guns n'Roses onto Gonzo’s Quest and beyond, there are tons of casino games on this site that are worth to play. From the latest Hollywood online slots to classic fruit machine video slots, from Roulette, Blackjack and Baccarat to live casino tabees, there is something for all tastes and new games are added each week! Claim your free gift via our special links or banners and try your luck! 4. The bonus will be credited within 24 hours. 5. Enjoy the action and get a 100% bonus up to €/$/£150 on your first deposit! This promotion is only valid for new customers who registered using special promotion links and banners. The bonus is only available to customers from the following countries: Austria, Canada, Czech Republic, Finland, Germany, Holland, Hungary, Iceland, Ireland, Latvia, Norway, Russia, Slovakia, Slovenia, Sweden, Switzerland, United Kingdom, Australia and New Zealand. You can win up to £100. Everything above this amount will be removed. For the clients from Germany, Austria and Switzerland games provided by Greentube Ltd. are restricted. When the customer submits his first request for withdrawal EnergyCasino may require to provide proof of identity and address as it deems required under the circumstances. 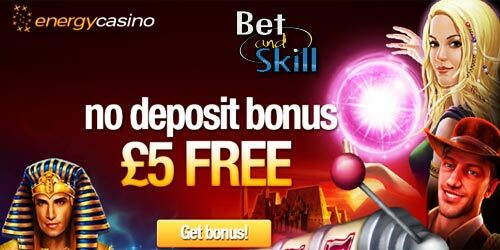 "Energy Casino €/£5 free bonus - no deposit required!"